Clustered in the lee of San Cristobel Hill, Bella Vista looks down across the river to the city of Santiago beyond. Bella Vista is a place apart and not just by virtue of its position. Its low, brightly painted buildings and small sunny squares are in sharp contrast to the neo-classical stone grandeur, towering concrete and vast plazas downtown. 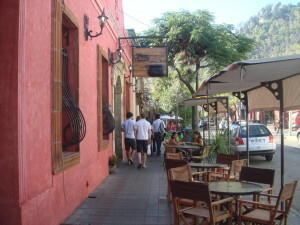 Bella Vista is a place of artists and artisans. It was here that the poet Pablo Neruda made his home in the beautiful La Chascona, which today is a museum. The haunting music of the Andes echoes through streets redolent of rustic Chilean fare and lined with theatres, cafes, restaurants and tavernas. It’s a lively, yet laidback, slow-paced place. Most mportantly, Bella Vista is the heartland of the rare blue-green stone, found only in Chile and Afghanistan – Lapislazuli. Here, in dozens of tiny workshops, craftsmen shape, fashion and set this semi-precious jewel into exquisite and unusual, yet very reasonably priced pieces. 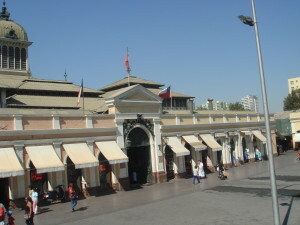 Constructed as part of the remodelling of Santiago towards the end of the 19th century, the Mercado Central, on Puente Street, reflects the wealth generated by the nitrate boom in Chile at this time. The turreted, towered, neo-classical building with its vaulted ceilings and grand entrances was originally intended as an exhibition building for local artists. 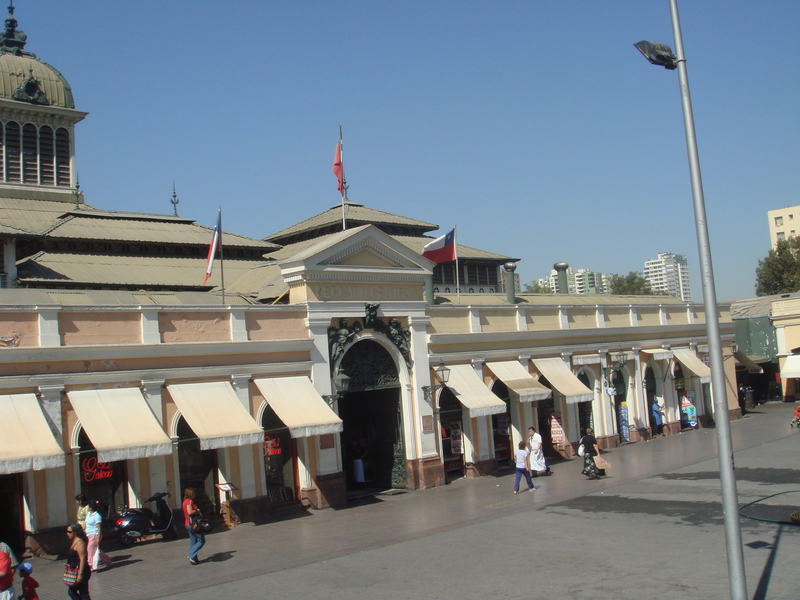 However in 1872, President Frederico Errazurriz Zanartu, decided that it would be the Santiago’s Central Market and so it has been ever since. Today, the Mercado Central is a landmark in the city. It flourishes as a fresh food market which showcases Chilean Seafood and traditional Chilean dishes like seafood stew and Conger Eel Broth. Like markets the world over, Santiago’s Mercado Central is a kind crossroads, where farmers, fishermen, vintners and orchardists from all over the region mingle with locals and tourists and where there are faces from every race and languages from every corner of the globe. Old Santiago is a many-splendoured city. A stroll back from Santa Lucia Hill, with its baroque fountain, neo-classical sculptures and terraced gardens, takes us through streets of magnificent buildings, like the grand old Biblioteca Nacional, the Teatro Municipal and the Bolsa de Commercio. Again, like the edifices of Santa Lucia, they are testament to what, in the 18th and 19th century, new world wealth could make of old world inspiration. 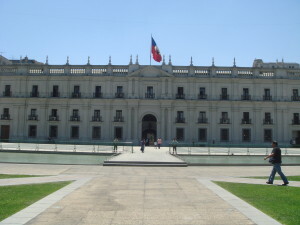 The most imposing of Santiago’s buildings stand around Plaza de la Constitucion and the most important among them is La Moneda, seat of the Chilean Government. Designed by the Italian architect Joaquin Toesca and constructed between 1784 and 1805, it is Chile’s finest example of neo-classical architecture. It was originally built to house the Royal Mint, hence the name, La Moneda. 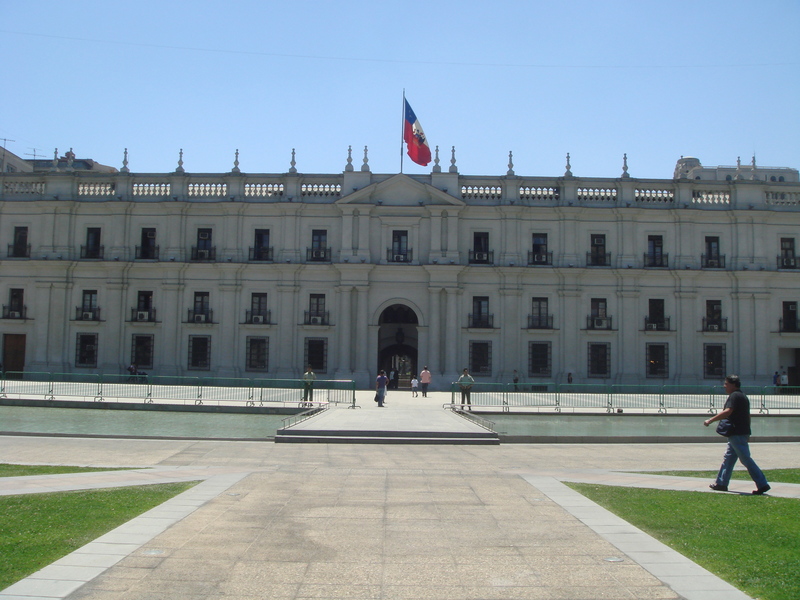 In 1846 President Manuel Bulnes appropriated part of the building as his quarters and it served as the Presidential Residence until 1958. Since then, as the Presidential seat and centre of government, it has seen many historic moments, including the suicide of President Salvador Allende after the 1973 Coup d’Etat. With the Andes as a backdrop, with architecture ranging from fine old sixteenth century churches to sleek modern commercial centres, with stunning squares, gardens and monuments and with a vibrant indigenous culture as well as a dozen different European representations, Santiago, the capital of Chile, is one of South America’s most fascinating cities. The first settlement, Santiago de la Nueva Extremadura, was established on February 12, 1541, by the Spanish Conquistador, Pedro de Valdivia, at the foot of the Huelen Hill. 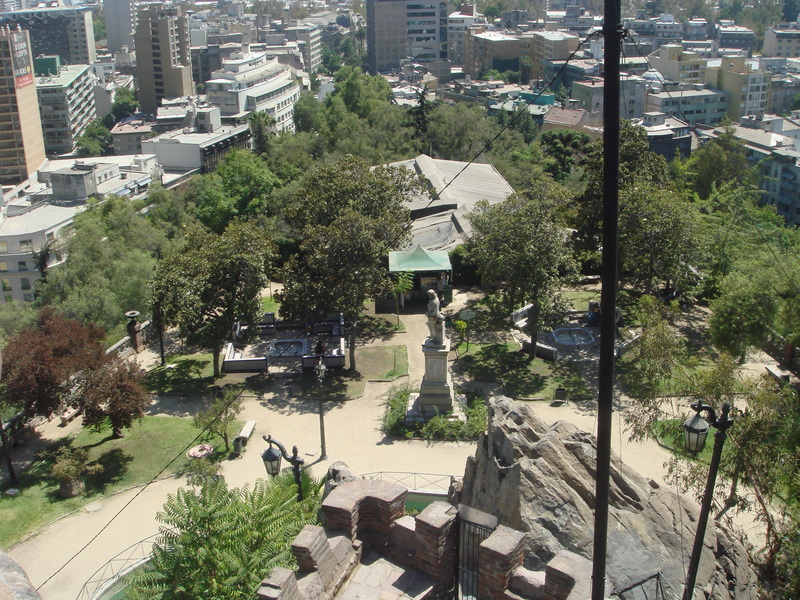 Now known as Santa Lucia, this hill is one of the city’s most significant and most visited sites. The neo-classical monumental entrance at the foot of Santa Lucia was completed in 1902. It reflects a city which, at the time, enjoyed considerable wealth and liked to flaunt it. At the centre is a statue of Neptune, god of the sea, surrounded by fountains and flanked by curving staircases which lead up to a terrace with a triumphal arch topped with a dome. The hill is threaded with winding, and somewhat challenging, paths which lead through pretty, sheltered little gardens and rest areas. 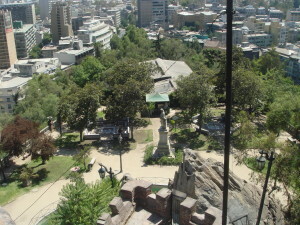 The views over Santiago from all sides of Santa Lucia, and most particularly from the summit, are spectacular.